This blog explores the collaborative process I followed as a Nippon Foundation-Nereus Program consulting artist. I was commissioned to create 17 illustrations celebrating the beauty and complexity of our planet’s oceans and fisheries. 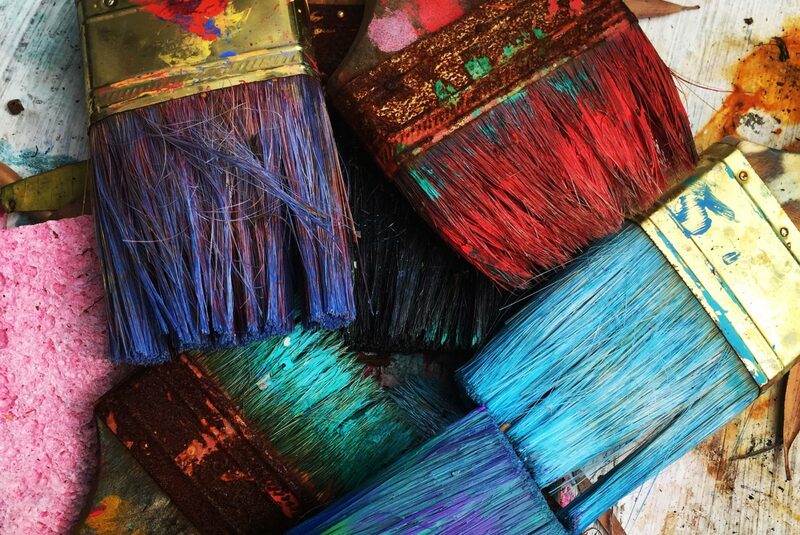 The final artwork series involved an 18-month partnership with Nereus leadership, staff and the organization’s international network of scientists, economists and policy makers. I was honoured to collaborate with great minds from six leading institutions around the world. Our goal was to produce painterly digital collages that were conceptual in nature but grounded in state-of-the-art research. The culminating body depicted a total of about 30 species within at least 16 diverse marine ecosystems. No charts or words populate these illustrations; they encourage viewers to complete their stories and perhaps want to learn more about their broad, open-ended themes. What are some topics that I covered? The Cost of Fisheries, Pelagic Ocean Fertilization, Oceans and Fisheries Modeling, Aquaculture, and High Seas Governance. 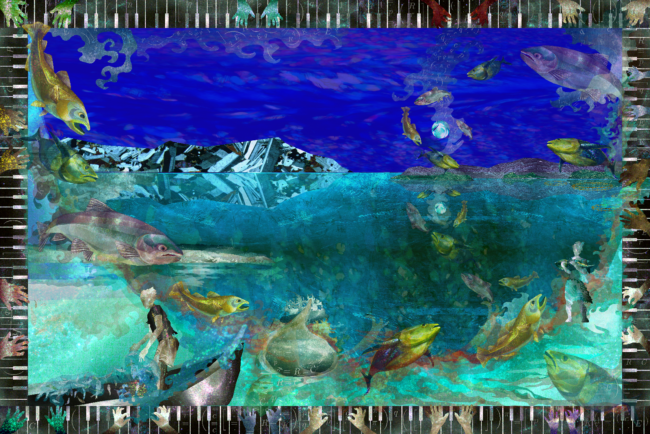 Although a final venue has yet to be determined, the artwork’s conceptual quality makes it possible to spin ocean tales in many different ways. Reflecting back on the process, the production of each piece loosely followed a predictable path – moving from linear to chaotic to serendipitous. After days researching and then drawing, I found that I would rearrange elements or make a mistake because I was fried. Frustrated, I’d save my changes and walk away from my computer. When I returned, it was as if a switch had turned off in my brain. Instead of wrestling for control, I was now following the artwork; it was like hitting a fair breeze on a calm sea; I followed light winds sailing the boat in an increasingly creative but always scientific direction. The first step in creating illustrations involved science orientation and brainstorming meetings with Nereus consultant, Ryan Vachon. Ryan envisioned this series and with, each theme, vividly introduced me to the science. Together, we’d brainstorm and scribble “flash” sketches onto scraps of paper. For example, as Ryan described ocean circulation and upwelling along the South American coast, I began imagining its bracing physicality. I felt like I was on a research vessel watching offshore winds churn water into a nutrient-rich upwelling driven by the Humboldt Current. Sketches and first meetings were just the beginning – like becoming fascinated with the science without knowing much about its complexity. Moving from brainstorming and scribbles to creating a full-blown concept took far more time than drawing. I typically spent 24 to 36 hours researching and then pinpointing references to guide the artwork’s creation. Ocean Circulation and Mixing by Jenn Paul Glaser. How did my visions develop? In the case of Ocean Circulation and Mixing, after days steeped in upwelling research, I stumbled upon ARKive videosshowing Cape Gannet gulls (Morus capensis). Their force inspired the final illustration, in which gulls torpedo through coastal Peruvian winds into a frenzied feeding world just below the surface. Suspending their breath, they pluck Pacific sardines from a swirling bolus. In turn, the sardines feast on phytoplankton and zooplankton (including Arcartia danae) awash in a cooled, oxygenated sea energized by the sun. As strong winds blow from east to west across Africa, dust is carried from the Sahara Desert and high into the atmosphere. This dust can be carried as far away as the Caribbean Sea, and across North and South America, where it eventually settles … It seems odd that storms in North Africa would have an impact on whales and seabirds thousands of miles offshore, but this is just one example of how connected all parts of the globe really are. ~ Excerpt from Andre’s essay. Pelagic Ocean Fertilization sketches. Left: Rough digital concept sketch, inspired by Andre Boustany’s essay. Right: Hand-written notes, drawn during a second collaboration meeting, to more accurately depict winds shearing plumes off North African sand dunes. As soon as I read this paragraph, the artwork’s concept popped into my head. Andre’s comments triggered me to imagine mind-blowing global connections between vastly different deserts (the pelagic Atlantic Ocean and the Sahara). The final illustration depicts massive plumes shearing off North African dunes and racing toward a sparsely inhabited open ocean. Far out at sea, an apocryphal mix of nutrients sifts down to jump start a food chain that works its way up from phytoplankton and zooplankton to North Atlantic right whales (Eubalaena glacialis) and an Atlantic mackerel (Scomber scombrus). 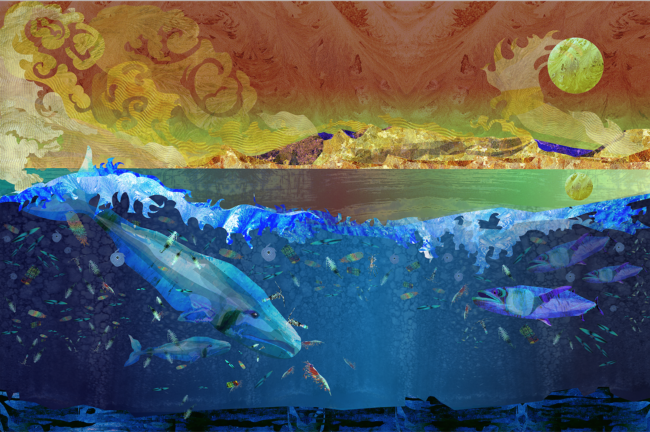 Final Ocean Fertilization illustration by Jenn Paul Glaser. I began each illustration by hand-drawing specific marine environments and creatures using a stylus as my brush and a tablet as my canvas – both electronically connected to my computer. Next, I transformed these detailed sketches into digital collages. Then I transformed these detailed sketches into digital collages by cutting and pasting textures into them. 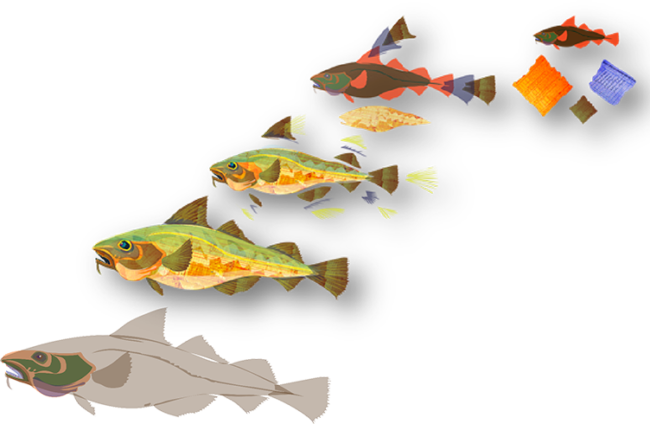 I used international currency (Cost of Fishing), microchips (Ocean and Fisheries Modeling) flags (High Seas Governance), and ancient Roman mosaic tiles (Aquaculture). For example, the Ocean Recoverycollage focuses on the uncertain recovery of codfish off the New England coast after a “1,000-year fishing spree”, culminating with the rise of huge freezer factory trawlers and a sudden 1990s collapse. Into my hand-drawn codfish (Gadus morhua) drawings I cut-and-pasted snippets from 1800s fishing logs. Fragile recovery? Ghostlike juvenile cod returning from ocean spawning grounds to swim among coastal eelgrass built from log pages. The trawler? A 1600s English prayer book alluding to Tragedy of the Commons mercantile faith. This collage and painting process was not linear, although scientific accuracy guided all decisions. I constantly moved back and forth from digitally drawing and refining elements to adding additional, semi-transparent textures. This process was like stacking translucent stained-glass windows on top of each other. Gradually, I built and painted collages that brought these otherworldly landscapes to life. 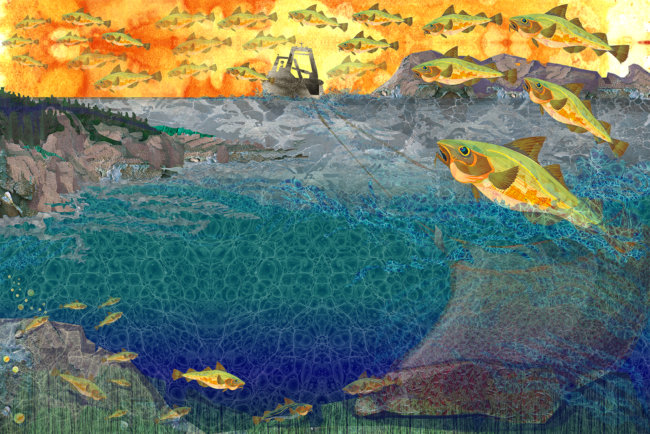 Final Ocean Recovery illustration by Jenn Glaser. Nereus Program / UBC Peter Wall Roundtable (December 2014): Nereus students, fellows and staff. (Jenn Glaser photos). One very memorable moment was when we were arguing about whether or not people ‘need’ fish. It wasn’t quite this black and white … In the end we agreed that at least in the short-to-mid-term, we all want the same things and the same actions … In terms of an analogy, have you ever seen the ‘Walk This Way’ video from Aerosmith / Run DMC? 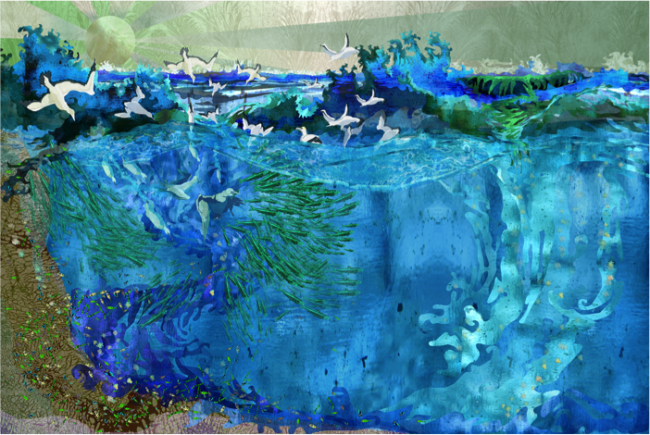 Future Oceans illustration, informed by Nereus fellows, staff and students (March, 2015). Note: It took hours of research to locate what I thought were specific phytoplankton and zooplankton species. Even though my illustrations were conceptual, the goal was to ensure they were firmly grounded in science. Note: In keeping with copyright laws, I did not use any photographs or artwork as textures. Instead, I drastically altered generic textures that I found online, ranging from rusted metallic patinas and snippets of Italian glassware and ancient Roman mosaics; to papyrus paper, NOAA maps, and liquid crystals to scans of specialty papers that I purchased. Using Adobe Photoshop software, I would resize and colorize textures to achieve the final effects necessary to any particular marine scenario or species. After cutting-and-pasting these altered textures into an illustration, I further changed them through complex layering, coloring. Often, two or three different collages would be layered on top of each other. Final alterations were made by digitally hand-painting the images to breathe into them as much light and form as possible.